I’ve been on YNAB budgeting system for 3 weeks now. Before that, I was on and off with my envelope budgeting, but since having reformatted computers and moving files, I didn’t have my old spreadsheets anymore so I had to start from scratch. Why did I buy YNAB? Jesse knows budget matters. Jesse Mecham, who created the YNAB on Excel and as a desktop application is also an accountant, so I trust he knows his spreadsheets. 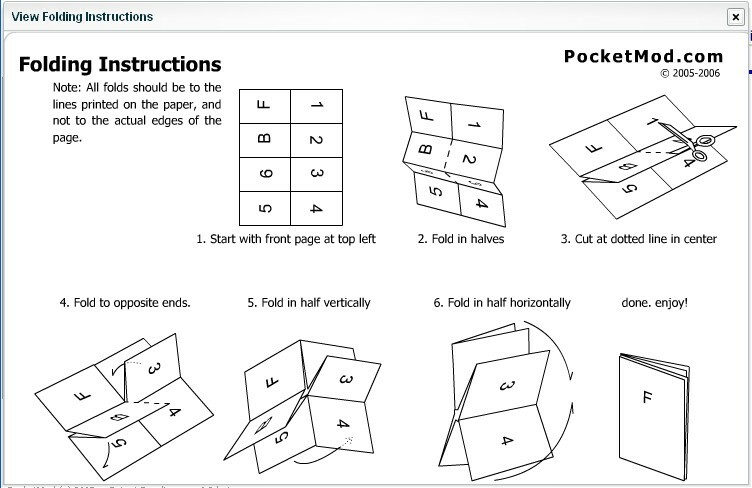 Easy tracking anywhere using YNAB Pocket Mod (how to fold) by fellow YNAB user Mudie. This teeny tiny booklet is where I track all cash expenses. Nifty! Goodbye envelope plastic case. It can be a hassle going around with a bunch of envelopes. JP would always look at me all weird when I pulled out my envelope case at the cashier. It helps that I’m on my iMac everyday so I update my YNAB at least every other day, while I’m still getting the hang of it. Rule #1 got me hooked. Being an entrepreneur, with variable income (timing andamount), it hasn’t been easy curbing the occasional splurge (like getting 4 pairs of sandals on sale at VNC Glorietta last June *sigh*) when I’ve given up a lot of other luxuries I’d gotten used to (weekly movies, meals out everyday, salon day, etc). So I’m building my buffer, which will help me truly NOT live from paycheck to paycheck. Can’t wait for YNAB Pro on Mac – due 2008. YNAB has two versions, YNAB and YNAB Pro. There’s YNAB Pro ($39.95) for Windows and already compatible with Vista. I got to try it on our HP laptop for initial setup and I really liked the interface. I can’t wait for the Mac version! Thankfully, there’s a toned-down version of YNAB ($19.95 – less than PHP1,000) that works on Excel/NeoOffice/OpenOffice so I went ahead and got my own copy and set it up on the iMac. 3 weeks in and I’m really happy with it. It’s addicting actually, scanning my 3 sheets (Register, Budget, Overview). $39.95 or $19.95 isn’t so bad at all considering you’re going to use it for years. You can know more about YNAB and order your copy online over at YouNeedaBudget. Pay by credit card (via Paypal or Google Checkout, just make sure there’s “https://” in the address bar) and you’ll get a personalized download link so you can download and install the YNAB Program. I've never heard about YNAB.. though I must admit that I do need a lot of help with cash moderation.. I've checked yahoo and google and Glyphius but nothing seemed too promising. I hope this works for me too. Wish me luck! This reminds me of http://www.moneytrackin.com/tour/about/ – I heard good things about it. The interface looks good. I have never tried it, though. What do you use now, Ingrid? It's already hassle enough to track each cent that comes out of my wallet… having to enter one by one on a website is just too much trouble. Recording takes me a total of 30-45 minutes for a month's worth of transactions. And I want easy access to my budget, no need to login, no dependence on 3rd party. I'm okay with SaaS for a lot else, but until there's no personal finance webapp like mint.com / moneytrackin.com / mvelopes.com that connects straight to my bank's (BPI) system, I'm happy with YNAB. I backup constantly anyway with Mozy (register via https://mozy.com/?ref=Z929CB)and trying out Wuala too (tell me if you want an invite) so I'm sure my YNAB file's intact. Isn't Glyphius software for copywriting? I just use my Palm Treo's “Budget Manager.” Nothing fancy. Tempted to resurrect my old MS Money files., but the problem is I use Linux now. Does YNAB work with Linux? Hello, you have a well laid out and informative blog. I'm looking to build more backlinks to my blog from quality sites so if you'd like to exhange links let me know. Leave me a comment/mail if you're interested. Thanks! Nice. I need to track on my budget using less paper. However a notebook and pencil are still good for back up. yep, i agree with Ben that's also the case with me that no matter how much i use these budget maintenance apps but i do write something in my budget diary to keep an updated look while on the go. Hi, I agree with you. I tried this software and it gave a great deal to my personal finances.I also made a diary to update and check all my expenses in a month. It was awesome.